Consdering that I was already trying to figure out how I could justify the expense of owning a JaDeD chiller, I could not send an enthusiastic "yes" reply to them quickly enough! We exchanged a few more emails; the guys wanted to know my typical batch sizes and the dimensions of my boil kettle (so as to ensure that they sent me the optimal chiller for my setup). I sent them the specs of my Bayou Classic 1044 stainless steel kettle, and they decided that the Hydra (aka their flagship product) was probably best for me. They then sent me some suggestons on optimizing the chilling process, and two days later, I had shiny, new Hydra sitting on my front porch. The first impression was that this thing was extremely impressive. There is a *ton* of copper involved in the construction of this chiller - far more than my generic immersion chiller uses. On further review, the craftsmanship is very impressive; the coils are tightly arranged, the layout is cunning. Multiple spacers are employed to not only keep the coils from touching, but also ensures that everything stays where it should be; the overall feel of the chiller is that it is quite sturdy. I wonder which one of these will perform better? This past Saturday, I was set to brew my take on Hofbrau's Oktoberfest; I was doing a six and a half gallon batch, with the intention of splitting off one gallon as an experimental brew using wild Alaskan ale yeast. Needless to say, I was quite excited to try out my new chiller. We've had a recent cold snap, and my ground water prior to starting was 58.3 degrees F - easily the coldest I can remember it being when I was trying to chill. My intention had been to simply hook my new Hydra up to my kitchen sink, as I was aware that my other choice would be to use a very long garden hose. 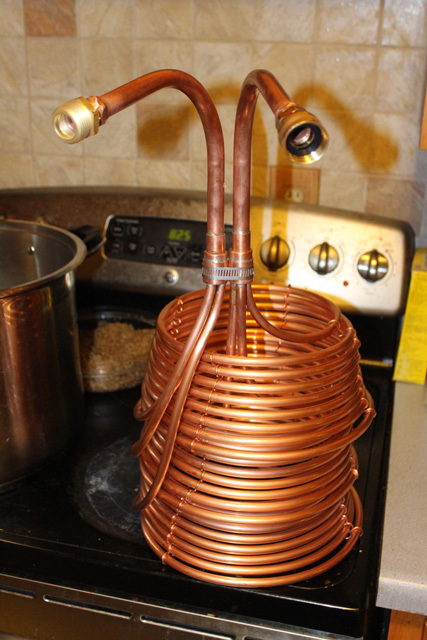 Sadly, I didn't think about this enough ahead of time; once my boil was winding down and it was almost time to put the chiller in the wort to sanitize, it hit me - the Hydra's input valve is attached directly to the copper, and is angled 90 degrees from my faucet connection. Rats, I'd have to use the hose. Oh, well. It was then that the real silliness set it. One hose wasn't long enough, I had connect two together (note to self - you REALLY need another outdoor faucet!). These, of course, had a slight leak at the connection point... and, for that matter, the original hose had a leak at the faucet itself. The hose didn't want to perfectly attach to the Hydra... add in another small leak. Worse, though, was the discovery - once I was under pressure - that I had several small leaks in the hoses themselves (apparently, our dog had decided to play with the hoses a bit at some point) - including one MASSIVE leak some twenty feet from the end of the hose. For best results with chilling, you need two things - one, your water needs to be on full blast, as the more pressure, the better. Two, you need to agitate the wort, as hot wort makes an excellent insulator; the parts next to the chiller coils will indeed cool quickly, but the parts away from it will remain hot. 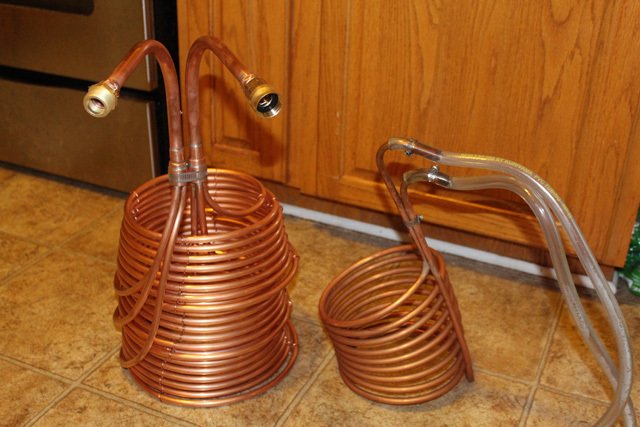 If you stir the wort or agitate the chiller, you can greatly reduce needed chilling time. I knew this lesson from my old chiller, and it of course applied to the Hydra. Even at full blast, the long hose length combined with multiple leaks led to poor pressure; the outlet flow was pretty weak. It took me better than three minutes to get below 150 degrees F, whereas the JaDeD site tells me that, with my water temps, I should have been able to get to 140 degrees F in 45 seconds. Ouch. I stirred, I tinkered with connections. It helped a small bit, but things were still going slower than I hoped. At the five minute mark, inspiration struck me. For grins, I stood on top of the big leak... and it stopped. Suddenly, the outflow from my Hydra was double what it had been! For those of you playing along at home, feel free to cue up the music control above... it perfectly narrates the rest of my chilling time. Water pressure is vital. Agitation is very important. To maintain my best possible water pressure, I had to stand twenty feet from my kettle... which, of course, made agitation impossible. I decided to stand in place for a bit, run to the kettle, give it a big stir, then run back. This ridiculous process repeated over the next few minutes. All told, despite my challenges, I was still down to pitching temperatures in under ten minutes. I cut the chiller off when I reache 68.5 degrees F, which took close to twelve total minutes of chilling time. The good news is that this is less than half the time it took for me to accomplish the same type of chilling with my old immersion chiller... and that was with me making an absolutely horrible effort and breaking all of the suggested guidelines for best results. I got an absolutely MASSIVE cold break out of this batch. Guys, this thing is *really* impressive. I'm going to try this experiment again soon - next time, I'll pick up a short feeder hose to attach to my kitchen sink, and I'll pre-fit it ahead of time. I can't wait to see what the Hydra can do if I give it half a chance. Full disclosure: I was given the Hydra chiller for free in exchange for this review. I was told in no uncertain terms to be honest and to not embellish my results. This is my 100% true, factual experience using the Hyrda immersion chiller from JaDeD Brewing. Any updates to this review since you have (hopefully) had time to work out the kinks and try it at optimal agitation and pressure settings? No update yet, thanks to the holidays. I will be using it again tomorrow!